Please note that while the dates on these sample reports are from the late ‘90s and early 2000’s, they were pulled from the 2014 versions of their respective sites. To be fair, there is a reason why hoteliers have used these kinds of hotel arrival reports for so many years. These reports contain valuable information about each guest. Through careful scrutiny, hoteliers can learn the first and last name of their guests. They can see the rate the guest agreed to pay, the source of booking, check-in and check-out dates, and in some cases, the VIP status of each guest and how many times he or she has stayed with your hotel. Hoteliers can also see whether each guest is traveling with a group, and whether the guest has a pre-assigned room. Sometimes, there is preference data, as provided by manual employee input. All of these items are important data for room assignments and overall front desk operations. The trouble is, the design of these reports makes it very difficult for hotel staff to surface this information quickly. It’s astounding that the design and capabilities of these core systems have not been updated over the last decade. So what are hotel arrival reports like this missing? Each morning, hoteliers should be able to see at a glance not only who is arriving on property that day, but what types of guests they will be serving. For example, this arrivals report is easy to scan to pick out vital pieces of information. A photo from one of the guest’s social media profiles can help the staff identify the guest. The front desk could address VIP guests by name before they even introduce themselves. Social data can identify guests that are perfect targets for surprise and delight campaigns as guests with large social followings are likely to share their experiences with their networks when they travel. 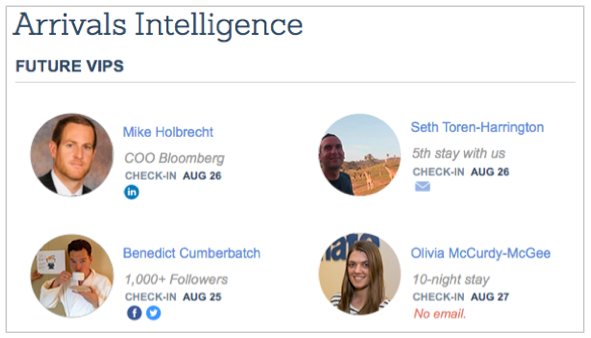 The hotel’s staff can see from this arrivals report that Benedict, who has a huge social network, is arriving on this day. The guest services team could visit his profile page to get information about his passions and interests and use this intelligence to wow him. For example, if he tweets that he’s looking forward to watching the Giants game after a long day of work, the guest services team could plan to send a couple of beers and some popcorn to his room with a note from the GM thanking him for his stay. Guests that are staying with the hotel for many nights could also be treated differently. The staff can and should greet these guests, such as Olivia, by name when they come and go. The hotel can also make an effort to ensure a more comfortable stay for these guests, by assigning them rooms with a little more space or a better view. One common pain point for hoteliers is email capture. A report like this would alert hoteliers when a guest has not provided a contact email, or other information. Hoteliers could see, at a glance, what information they still need to collect from guests at check-in to improve the database and ability to communicate with guests in the future. This may be the difference between a repeat guest that books with an OTA, and a repeat guest that books directly with your hotel on her next stay. Additionally, an Arrivals Insight section like this one allows hoteliers to see critical stats around check-in and check-out activity. These stats allow managers to adequately staff the front desk and housekeeping to accommodate the guests that are coming and going. This scenario isn’t hypothetical—it’s a reality. The Arrivals Report is just one of many features of Revinate’s inGuest that enable hoteliers to deliver ultra-targeted guest services for the optimal guest experience.